Last year, on behalf of, the Parkgate Society Community Spirit group I successfully applied for a Community Project Grant from Plus Dane Housing. The 'Love your Neighbourhood' scheme funds improvements in the areas where Plus Dane tenants reside. In support of the grant application Martin Barker, our CWaC councillor, agreed to match fund from his CWaC members budget. 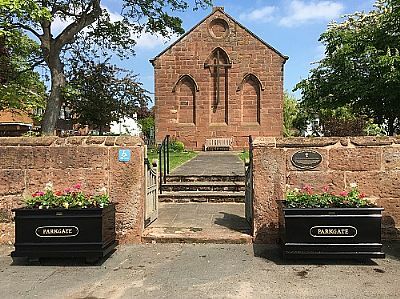 I applied for the grant to fund the purchase of planters, hanging baskets and an additional bench for Parkgate Parade. The planters were installed by volunteers last weekend and have now been planted up with plants from the local Marsh Nurseries. The flowers certainly improve the area and judging by the many comments we received from passers-by as we planted up this morning they are a very welcome addition to Parkgate. The next stage is the purchase of a hanging basket for the heritage lamppost on Mostyn Square and also hanging baskets for the toilet block area on School Lane.